There is a new phrase in the world of paintball. It’s Low Impact Paintball. Paintball has been such a popular game, but honestly, there was a bit too much sting in getting hit to appeal to the mass market. In order to over come that stigma, the concept of Low Impact Paintball was used as a marketing buzz word. 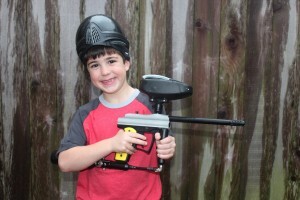 The item that made the biggest difference was the 50 caliber paintball gun. A standard paintball is 68 caliber (.68 inches in diameter) and a .50 caliber paintball (1/2 inch diameter) has less mass to it. The idea is a smaller paintball would make for a low impact paintball experience. There is More to Low Impact Paintball than the size of the paintball! How far away where you when you got shot? Which paintball did you get shot by? What is the temperature of the paintball? All these things can influence what it feels like when you get shot. This is real paintball. Don’t confuse our field with the ones that use the cheap plastic guns that you have to pump each shot. We use real paintball guns, but they shoot smaller paintballs at a lower velocity. We tune our 50 caliber guns down to a slower speed than our standard 68 caliber guns. That sure helps! But that’s not all. Gulf Coast Paintball uses rules where players are not allowed to cross the middle of the field. This means no one can run up and shoot a player at point blank range. New and nervous players can hang near the back where no one can get within 50 feet of them. Paintballs flying that far lose a lot of their energy making the hits far less intense. Many liken the hit of a paintball to be equivalent to being snapped with a rubber band. On bare flesh, that can sting! But if snapped with a rubber band while wearing long sleeves and a hooded sweat shirt over it, you will hardly notice it! There is actually a huge difference in the paintballs. That is why at Gulf Coast Paintball, we don’t allow people to bring their own paintballs. We are FIELD PAINT ONLY. While some paintballs will feel like rocks when they hit you, we use a specially formulated paintball that breaks easily and will not stain. The easy break paintballs hurt less again making our facility a low impact paintball field. Paintballs don’t like heat – and they don’t like cold. They want a standard room temperature to maintain their breakablilty. Gulf Coast Paintball’s paint is delivered in climate controlled trucks, then kept in sealed bags in our climate controlled facility. This strict quality control consistently insures the paintballs will be low impact.